49ers representatives told NBC Bay Area players are currently taking part in a 10-week session of workouts, which occur Monday through Thursday during late morning. There’s a whistle followed by a series of heavy bass beats emanating from the San Francisco 49ers practice facility on Wednesday morning in Santa Clara. However, after neighbors voiced concerns about the decibel levels, the team says it will turn the speakers inward during practice to help with neighborhood noise. 49ers representatives told NBC Bay Area players are currently taking part in a 10-week session of workouts, which occur Monday through Thursday during late morning. 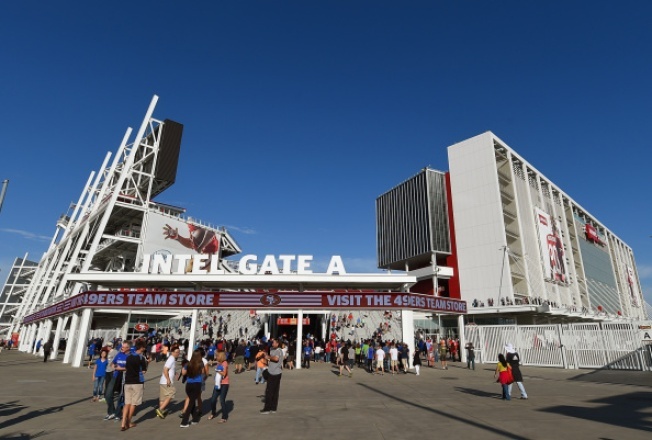 It’s common in the NFL to crank up the music during practice to simulate stadium noise, but the tunes are out of sync with some of Levi’s Stadium’s neighbors. “My actual home actually shakes. The appliances shake. If I happen to have a glass sitting on my counter when the 49ers are practicing and it gets really loud, the glass actually shakes,” said Rita Miller, who has lived in the Primavera neighborhood since the early 1990s. From Miller’s house, roughly three football fields away from the practice facility, the music peaks at about 80 decibels, according smartphone app Decibel 10th. That’s about as loud as a diesel truck passing by, which is inconvenient for people who work from home like Miller. “I’ve actually had to go into a bathroom and shut the door so that I could actually hear,” Millers said, explaining she is often on the phone with elderly clients. Across the street on Calle de Primavera, her neighbor Antonino Vergel de Dios also took steps to gain some peace. “I had been planning to put in new windows, but I made it earlier because it’s really bothering me. It’s too much, you know?” Vergel de Dios said, explaining stadium noise during games does not bother him. Neighbors say they had given up on making formal complaints because it rarely leads to change, but comments online caught the attention of newly-appointed Santa Clara City Council member Kathy Watanabe. “The fact that people felt like they weren’t being heard – I thought this is not good. The community needs to know their concerns are not falling on deaf ears,” Watanabe said. She says she is meeting with the Santa Clara City Manager to measure decibel levels in the neighborhood if the noise becomes a long term issue. Meanwhile, 49ers representatives say Thursday morning the speakers will be turned toward the stadium and neighbors should sense some relief. And say, if they don’t, call the team.